If you are looking for some geek coture or for a present for me, take a look inside. THE SHOW OFF T-SHIRT is a t-shirt with a built in sound sensitive graphic equalizer panel. As the music beats, the shirts equalizer lights up to the beat of the music. This amusing unisex T-shirt has 4 AAA batteries that are within a hidden, washable battery compartment. The batteries last from 12-36 hours depending on whether you are operating in the digital clock or stop-watch mode. 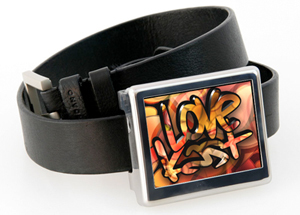 The idea behind this is pretty simple, it is a 3-inch screen mounted on a stainless steel case that can attach to any standard belt. To play video all you need to do is insert an SD memory card and bam, video playback on your crotch. A pair of Uranium-Jeans is the result of an amalgamation between silicon and thread. Based in France, Uranium-Jeans offers customizable jeans that displays scrolling text messages via the embedded flexible micro screens. These screens come in a variety of colors and you can download the messages via the brand’s website or texting it over from your cellphone.